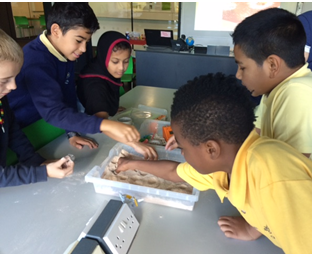 Yesterday, Year 5 took their Solar System learning out on the road after being invited to visit Westminster Academy’s physics laboratory. 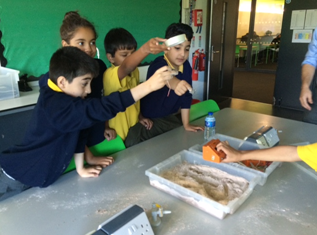 When we first arrived, we were encouraged to experiment with ‘moon dust’ (flour and chocolate powder) and ‘meteorites’ (various sized weights) to investigate what would make the deepest crater in the moon’s surface. We discovered that a larger object dropped with greater power created the deepest indentation. Then we made balloon rockets! 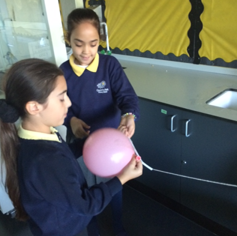 We soon discovered that with the simplest of materials -a balloon, straw, cellotape and string - we could build rockets powerful enough to shoot across the room. The bigger balloons we could blow, the bigger the blast off! It was a fantastic opportunity to get to use equipment inside a specialist laboratory and we hope to be invited back again soon. Finally, once we were back at school, we met as a year group to share everything we’d learnt on the Solar System so far. What a great day!